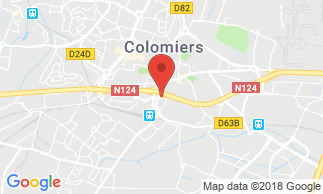 Brit Hotel Esplanade is a charming 2-star hotel situated in the city of Colomiers, a few minutes away from Airbus site, the airport of Toulouse Blagnac and Toulouse city center. Its 40 rooms are equipped with all modern comfort and its staff welcomes you 24 hours a day and 7 days a week. Brit Hotel Esplanade proposes 40 rooms, all equipped with the following elements: bathroom (bathtub/shower, toilets, hairdryer), tray of courtesy, phone with direct line, flat-screen television, satellite with foreign channels (ZDF, Eurosport UK, Pro 7, Viva, CNN etc.) and a free WIFI internet access.
. 2 rooms are fitted out to welcome the customers with reduced mobility. Brit Hotel Esplanade is situated in Colomiers, within a few minutes in transport or by car from main points of interests of the region. Continental breakfast not included in the room rate: 13 EUR per person. It can be served in the breakfast room or in your room (supplement of 4 EUR per person) between 6.00 am and 9.30am. Room service for dinner is possible from 7.30 pm till 9.30 pm: supplement of 4 EUR per person.